Mayme Kratz is an American mixed-media artist best known for creating art from the natural life of the desert that surrounds her Phoenix, Arizona home and studio. Kratz was born in San Diego County, California. She is self educated and was focused on her creativity at an early age. So, in her early twenties she began as an apprentice to the artist James Hubbell. Ever since she was a little girl, Kratz says, she felt “a sense of destiny” about pursuing the kind of art that she does today, and the way in which she brings value to the infinite debris of the natural world proves that she was right. 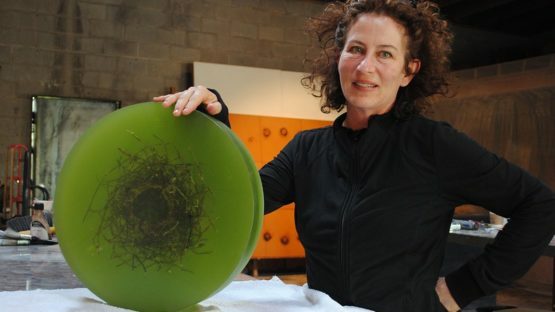 Her later artistic shape experience includes stints at the Pilchuck Glass School and The Museum of Glass, both in Washington. She moved from her native San Diego to (as will turn out later) a very inspiring Phoenix in 1986. For many years, Kratz worked in her studio south of downtown Phoenix. Even though she is showing her work all over the country, she sees Arizona as her natural home as it is a primary source of inspiration for her artistic expression. As a part of her creative routine, Kratz is used to walk the trails in the Phoenix Mountain Preserve and Superstition Mountains. On those paths, her eyes are in constant pursue of weeds, seeds, feathers, insect wings or some other organic residues she might use to create an artwork. First step is to collect found objects, usually into her sun, hat so she can later examine nature’s castoffs under a microscope to study colors, textures, forms and patterns. That is where inspiration has its turn: quickly she envisions the reshaping of the materials into cast-resin wall pieces or columns. Some may say that she is very skilled in finding and creating beauty where others might not see it. 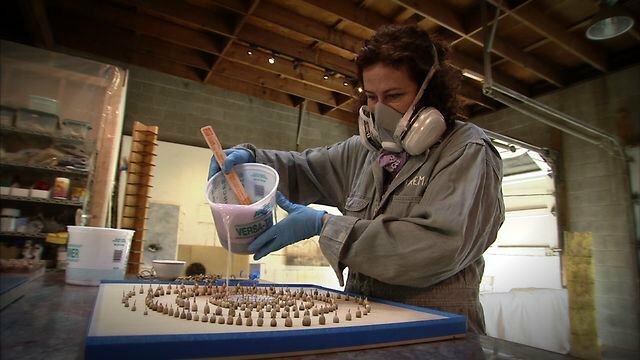 Mayme Kratz manipulates these revered objects from nature into precise patterns and then she applies a few coats of resin. Later, by gradually cutting and sanding away the surface, Kratz reveals the objects buried under multiple layers of resin. She then paints it, and inflicts various chemicals to complete the panels. In that process, even the smallest of objects reemerge as part of circles, spirals, ripples and more – in her work she always sees limitless possibilities for reinterpretation. Kratz’s artistic strength lays in her ability to change unappealing aspects of nature into compositions that become ethereal; one can look at some of her pieces closely and still not realize what she used, whether is a fish bone or bird of paradise seeds. Kratz has created and nurtured a three-dimensional language to express the crucial elements of her own poetry as a human being in balance with the surroundings. 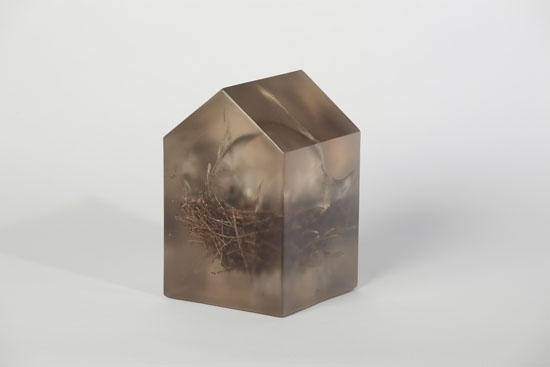 Her three-dimensional creations highlight the interconnections in nature, space, and the creative spirit. 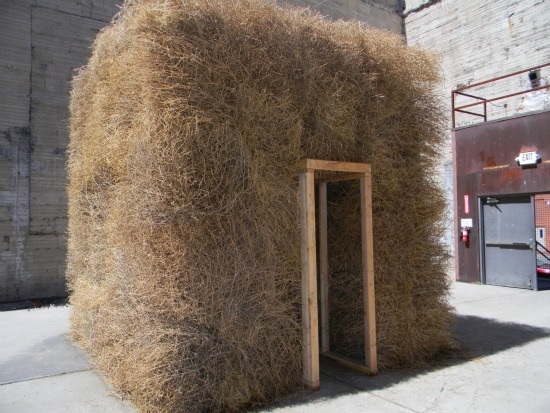 Besides hanging and freestanding works, Kratz has also made a variety of videos and installations, including an interactive outdoor sculpture made of found tumbleweeds meant to disintegrate over time. Mayme Kratz also experimented with tree rubbings and various works on paper. She even imitated nature itself and fabricated nests from the materials she found on her walks. In 2012, Significant Forms- Mayme Kratz and Melinda Bergman’s exhibition was shown at Scottsdale Museum of Contemporary Art. This museum is known for its aim to bring art, architecture and design to Arizona in order to challenge the natural order and expectations of art. For this show, curators from the SMoCA chose from the museum’s permanent collection a range of modern and contemporary works, an objects that provoke the aesthetic emotions. Significant forms featured some of this pair’s best work including Kratz’s video entitled Tumbleweed Bower and a small nest secured in a house-shaped resin form, in the center of the exhibition. The show also includes pieces by Ken Price, Barbara Hepworth, and Jean Arp. In 2013, a director and producer Suzanne Johnson made an art documentary about Mayme Kratz in attempt to offer viewers a glimpse into her creative process. The film is titled Mayme Kratz/Stand Still, and throughout it she speaks to the poet in all of us and causes us to reconsider what it means to pause and pay attention. Addressing her process of making art, the documentary presents how this artist’s delving into the particular suggests a better understanding of the universal through an examination of light, color and form. Mayme Kratz / Stand Still was accepted by the National Educational Telecommunications Association for their PBS affiliates. In 2013, Kratz’s works were on view at Lisa Sette Gallery in Scottsdale, on exhibition titled Sometimes the Darkness. The name comes from the fact that some of the panels were thickly coated to produce a blackish background. The patterns on various pieces reminded of supernovas, galaxies and planets – in thoughts of micro and macro cosmos with an idea to take the viewer on his own meditative journey. The title piece, Sometimes the Darkness, employed cross sections of magnolia seeds. In 2015, Lisa Sette Gallery commenced its thirtieth anniversary with an exhibition of new works by Mayme Kratz and Alan Bur Johnson, artists concerned with permanence and ephemeral, encapsulated by the cellular systems and organic matter of the Arizona desert. 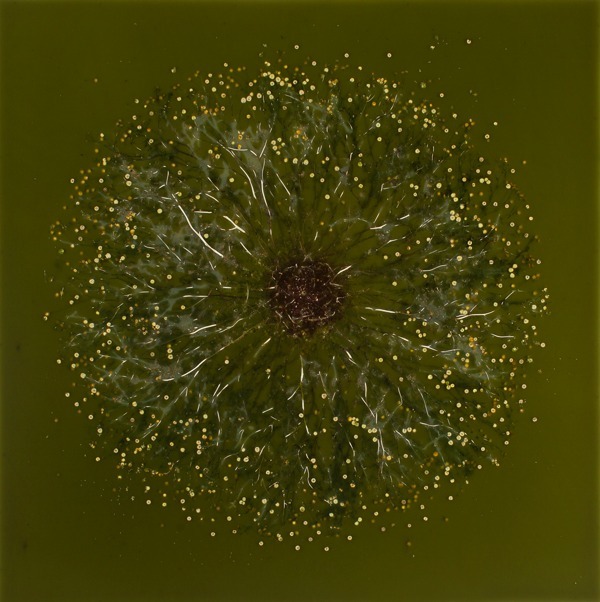 The works of Kratz and Johnson reflected on the transitory structures, both material and immaterial, that comprise a biological life. Mayme Kratz’s work can be found in many private and public collections throughout the United States. She is represented by and exhibits regularly at Lisa Sette Gallery, Elliot Brown, Anne Reed Gallery. Mayme Kratz lives and works in Phoenix.